Miss Ellaneous is Karen Edelenbos a talented circus performer, circus educator and all round circus aficionado. Karen has been performing since 2008 in a variety of settings as diverse as cruise ships, 1860’s goldfields, art galleries, science museums, fringe festivals, art bus tours and for hordes of screaming children (the good kind). From an elegant 1920’s themed juggler for you soiree, to an outrageous leopard print wearing, hula hooping MC or an experienced circus teacher, Miss Ellaneous can work with you to create a vision for your event. 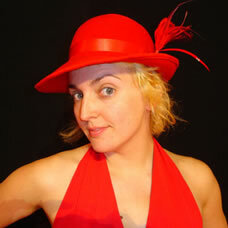 Inspired by vaudeville, music hall and tap dancing; Miss Ellaneous can bring a touch of elegance to any function.